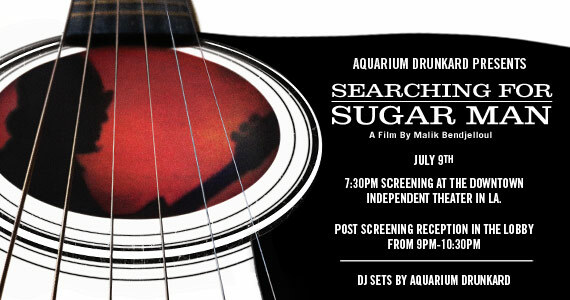 Next Monday, July 9th, Aquarium Drunkard presents Searching For Sugar Man, the Malik Bendjelloul documentary on the life, and mystery, surrounding 70s psych-folk musician, Rodriguez. We saw it last month at the LA Film Fest and it boasts a narrative that goes way beyond typical rock-doc. No small feat. We’re making the night a party giving away 40 pairs of tickets with an afterparty following the screening starting at 9pm (free booze! food!) and Mondo Boys DJ sets. Come hang out. It’s at the Downtown Independent theater (next to the Smell) at 251 South Main Street. To land a pair, leave your name (and a working email in the comment field) below with your favorite Rodriguez tune. Winners notified Sunday. The original motion picture soundtrack album will be available starting July 24th through Legacy Recordings. I Wonder. cuz i do. “Crucify Your Mind” for sure! There wouldn’t be a extra pair of tickets would there? I remember listening to this in high school. It would be great to see a documentary on him! “I think of you.” Nice song! You just posted it! Sugar man all the way! I wonder is a definitive jam! inner city blues is a great one! Toss up between Sugar Man (it was my first experience with the music of Rodriguez, and I was instantly hooked) and I’ll Slip Away from Coming From Reality. Looking forward to catching Sixto on the Big Screen…Keep Talking Baby!!! ooo, Hate Street Dialogue or You’d Like to Admit It. tough choice. Any chance this will be showing in his native Detroit?